This one, which came out for the 2015 Winter Hello! Cons, would be Berryz' last as well as Country Girls' first. It also pre-dates Kobushi Factory, who were announced at that Hello! Con itself. Thus, the usual questionnaires are supplemented with a Berryz Kobo special as well as a new members special (MM 12ki, S/mileage 3ki, the 5 new Country Girls). Shimizu Saki: ℃-ute's 'Hitori Shimeshitakattadakenanoni'. I started to like it a lot more when I heard it at the September 10th Budokan performance!! It's a good song. Tsugunaga Momoko: ℃-ute's 'Momoiro Sparkling'. That's Momochi's song! When ℃-ute released this song, I though 'Why wasn't it me!? ', I think so even now (laughs). Tokunaga Chinami: The title of S/mileage's 'Samui ne.' is cute. You want to listen to it in winter!!! Ah, but I occasionally listen to it in summer too. 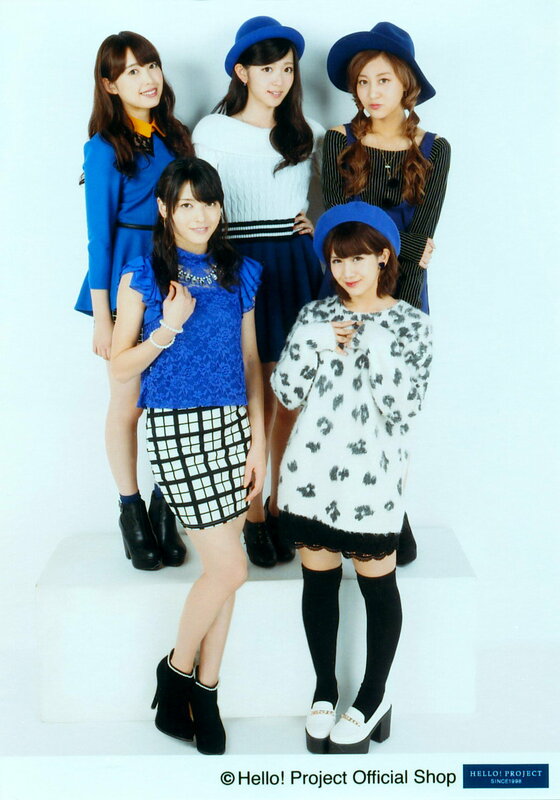 Sudo Maasa: I've always loved ℃-ute's 'Namida no Iro', from way back. Natsuyaki Miyabi: I've always liked S/mileage's 'Samui Ne.' from the moment I first heard it ♥ When it's wintertime, I want to listen to it more. Sugaya Risako: S/mileage's 'Samui ne.' and Juice=Juice's 'Ijiwaru Shinaide Dakishimete yo'. Yajima Maimi: 'Fighting Pose ha Date Janai' may be a Berryz Kobo song, but it's a song I've got a strong emotional attachment to, it's a song that rouses my feelings, like feelings of frustration or wishing that I could shine like that. Nakajima Saki: 'I Wish' is a really lovely song. I'd like this song to lift people's spirits in the future as well. Okai Chisato: I love Morning Musume。´14's 'Toki wo Koe Sora wo Koe' ♥ I've listened to it countless times. It's just so lovely ♥ I like the lyrics in particular. Hagiwara Mai: Morning Musume。's 'Do It Now' and Morning Musume。 Sakuragumi's 'Hareru Ame nochi Suki ♥'. Ikuta Erina: ℃-ute-san's 'Adam to Eve no Dilemma'. Hagiwara-san was super cute in this song. The song itself really makes me feel like singin it, so it's a must-sing song when I go for karaoke. Sayashi Riho: I like 'Hadaka no Hadaka no Hadaka no Kiss', where the rhythm is finely carved out without leaving gaps. I love the songs in Juice=Juice's repertoire, so I'd like to try singing them someday-!!! Suzuki Kanon: I like the melody of Berryz Kobo-san's 'Aa, Yo ga Akeru'. I also like Kumai-san's 'Kurushimemasuka~' that opens the interlude. 'Kiss Me Aishiteru' was the very first performance I saw live after I joined. That stylishness was emotionally moving, and even now it's my favourite ℃-ute song. Iikubo Haruna: S/mileage-san's 'Tachiagirl'. Listening to the really positive lyrics lifts my spirits. The outfits are really cute, so I'd like to try wearing them. Ishida Ayumi: S/mileage's 'Tabidachi no Haru ga Kita'. The lyrics give you courage, and its strong, sparkling image makes you want to listen to it. I also like it when you get immediately pumped up from the final chorus where Tamura Meimi-san ad-libs. Kudo Haruka: Buono!-san's 'Kataomoi.' The key is low and it's easy to sing, and I like how it's cool and lifts the mood. Ever since I sang MoBeKiMaSu's 'Moshimo...' at the HinaFes, lots of people have told me, 'I wish you could sing it once more', which made me really happy (blushes). Oda Sakura: ℃-ute-san's 'Midnight Temptation'. I performed it when I was a Kenshuusei, but I have many memories of practising it a lot, I love its melody. It's cool! Ogata Haruna: 'Tabidachi no Haru ga Kita' (S/mileage) is really cute, I'd like to try singing that song someday. I love 'Love take it all' (℃-ute) because the dance is super cool. Nonaka Miki: ℃-ute-san's 'Sekai Ichi Happy na Onna no Ko' and 'Ooki na Ai de Motenashite' are really cute, they lift my spirits! The MVs are girly too, I love them. Makino Maria: ℃-ute-san's 'Seventeen's vow'. I got to sing this song when I had the opportunity to go along with their concert tour. I love it, it's a really cute song. I got to sing Nakajima-san's parts. Nakajima-san was really super cute in the video that I got as a reference. Hoping to get as close as possible to Nakajima-san, I watched the video and practised countless times. Haga Akane: I've liked Berryz Kobo-san's 'Happiness ~Koufuku Kanfei!~' since I was small, and have always sung it. 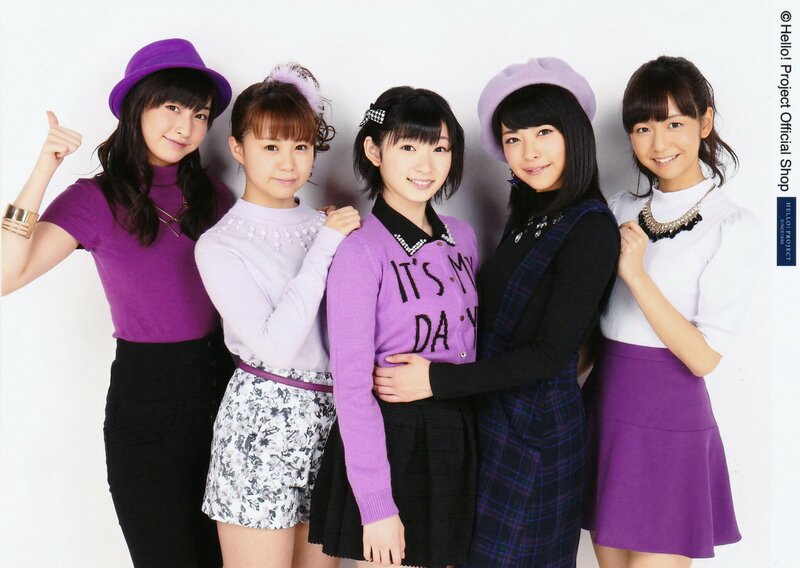 Fukuda Kanon: Berryz Kobo's 'Koishiteru Toki ha Itsumo...' No reason in particular! At any rate, I love this song! Nakanishi Kana: U-m, all of them. I like how all of them have their own flavour. I can't decide on one song! Katsuta Rina: 'Over the Rainbow'. I've liked Buono!-san from the start, and have listened to their various songs, but among those, this one is really my cup of tea. Tamura Meimi: ℃-ute-san's 'Kokoro no Sakebi wo Uta ni shitemita'. I've been listening to that song a lot recently, singing it. I like the adorableness of the song from the heart of a sorrowful girl. Murota Mizuki: Morning Musume。-san's 'Memory Seishun no Hikari'. Because the falsetto is really pretty. Aikawa Maho: I like the mood of ℃-ute-san's 'Campus Life ~ Umaretekite Yokatta~' and the part where they repeat 'Suki Suki Suki' is adorable. Sasaki Rikako: Berryz Kobo-san's 'Natsu Wakame'. I like the really summery feel! Miyazaki Yuka: S/mileage-san's 'Eighteen Emotion'. Just watching it from the cheering seats at the Hello!Con was tons of fun. Since Sasaki Rikako-chan's dancing is really dynamic, I can't wait to see it. Kanazawa Tomoko: Suzuki Airi-san's 'Yes! all my family' has positive messages in the lyrics, the melody makes you feel cheerful and energetic, and then there's Suzuki-san's singing, I love everything about it. It's a lovely song, , whenever I listen to it when I'm feeling down, it always makes me want to sing it. Miyamoto Karin: I like the sorrowful lyrics for Morning Musume。 Sakuragumi-san's 'Hare Amenochi Suki♥', the complicated feelings of the girl. Uemura Akari: ℃-ute-san's 'Kono Machi'. I often listen to it on the train in an unhurried mood. Morito Chisaki: I like 'Moonlight night ~Tsukiya no Ban da yo~' since it's cool and has impact! I love 'What is Love?' since its fun! Still, despite MM's long history, ℃-ute songs had the most mentions. Totals don't sum up to 44 since some people chose more than one song.